Backpackers, students, adventure travellers, people on a weekend getaway, first and tenth time travellers from all over the world stay in hostels in Berlin. My Destination gives you the low down on the best budget accommodation in Berlin. 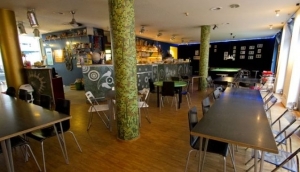 Berlin city hostels are great for cheap accommodation and a welcome, communal feeling. With everything on offer from single and double rooms with en suite bathroom to 20 bed dorms. Most have kitchen facilities and and offer a buffet breakfast. Hostels in Berlin are fun, laid back, and conveniently located in areas like Mitte, Kreuzberg, Prenzlauer Berg and Friedrichshain. Meet travellers from all over the world in the common room or join in activities organised by the hostel. Check out My Destination for the new breed of hostel that include a little bit of luxury with still awesome rates.